You've seen our walking tours, now try our Brew Bus tours! Their official start date is May 11. You have until May 3 to use promo code "RideTheBus" to receive $10 off your Brew Bus tickets. With almost 20 breweries, York County is quickly becoming the craft beer capital of the Mid-Atlantic. This bus tour will lead you on an educational immersion, as you explore and experience 3 of York County's amazing breweries in the comfort and fun of the York County Ale Trail Brew Bus. Join our experienced Beer Guides as they lead you through exclusive facility tours, provide historical and anecdotal insights, guide you in sampling up to 12 different beers, meet some of the brewers and receive 3 beer tokens for complimentary pours on a return visit. Whether you're a beer aficionado, a novice, or someone who wants to learn more about the York County craft beer scene, the York County Ale Trail is for you! Spring is here! It’s the perfect time to join us on a walking tour and visit the breweries that downtown York has to offer. With almost 20 breweries, York County is quickly becoming the craft beer capital of the Mid-Atlantic. 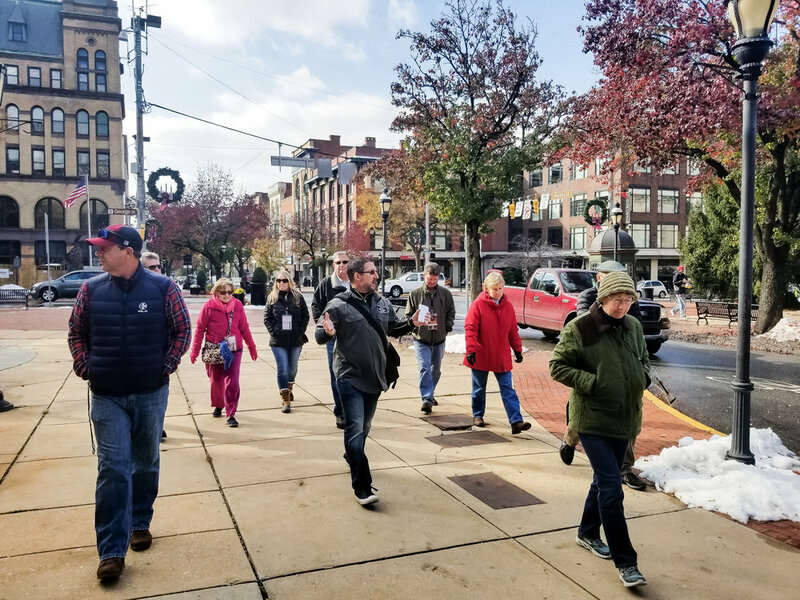 This walking tour will lead you on an educational immersion, as you explore and experience 3 of Downtown York City's anchors. Join our experienced Beer Guides as they lead you through exclusive facility tours, provide historical and anecdotal insights, guide you in sampling up to 12 different beers, meet some of the brewers and receive 3 beer tokens for complimentary pours on a return visit. Tickets are $59 per person/Designated Drivers are FREE- tours require groups of 4+ people to operate. Before you rock out at CapLive’s Classic Albums Live, take a guided, educational tour of York County's best breweries on the York County Ale Trail! With over 17 breweries, York County is quickly becoming the craft beer capital of the Mid-Atlantic region. Join our experienced and knowledgeable beer guides on an educational immersion into the York County craft beer scene- you’ll explore 2 of downtown York’s best breweries, sample 8 different brews, experience exclusive, behind-the-scene tours, and learn historical and anecdotal insights about York County. Tours will begin at 4 PM and tour 2 breweries. There is a minimum requirement of 4 individuals per tour. Before you rock out at CapLive’s Croce plays Croce event, take a guided, educational tour of York County's best breweries on the York County Ale Trail! Before you rock out at CapLive’s Todd Snider event, take a guided, educational tour of York County's best breweries on the York County Ale Trail! This weekend marks a very special time for beer culture- on April 7, 1933, the Cullen-Harrison Act was enacted in the United States, which allowed the sale of beer with a maximum 3.2% alcohol content level. Signing this Act was one of the first things FDR did during his presidency. It resulted in one of his famous quotes, "I think this would be a good time for a beer." FDR was also the first person to get a batch of the newly legal beer- everyone else waited patiently while it was delivered from city to city. An estimated 1.5 million gallons of beer were drank in celebration that day! In today's society, April 6 is known as New Beer's Eve and April 7 is known as National Beer Day- both those dates happen to fall on a Saturday & Sunday this year, so we will be hosting very special tours this weekend to celebrate! P.S. Rumor has it you'll earn a special badge on Untapped when you check in a beer on April 7!